St. John the Baptist Church, 44 Church St., Quincy, MA. To commemorate the birth of our Lord, Jesus Christ. 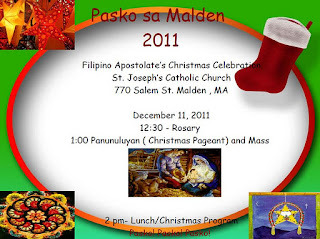 All are invited and welcome to a Christmas reception and entertainment after the Mass. Our distinguished guest, Santa Claus will distribute gifts to children and encourage our guests to have their photos taken with him. Please remember to bring a wrapped gift with your child/children's name for Santa to give. This will be Santa's last stop before going home to the North Pole. You may also bring a dish or dessert (optional) to share with the community, which we'll greatly appreciate. Please call Loreta Borneo (617-328-9046), Ruben Austria (617-851-1667) or Teng Chiefe (781-963-1740) with any questions or concerns. Christmas is the most important Catholic holiday revolving around the story of how the Virgin Mary gave birth to Jesus Christ, the son of God. Christmas is celebrated throughout the Christmas Octave, the eight days from December 25 through January 1. The second day of the festival, December 26, is devoted to St. Stephen, the First Martyr; the third, to apostle and evangelist John the Baptist (on that day wine is consecrated); the fourth day is devoted to the memory of the Holy Infants of Bethlehem (on that day priests offer special blessings to children). Sunday, which falls on one of the days between December 26 and 31, or, if none of the days is a Sunday in a particular year, December 30 marks the feast of the Holy Family: the Christ child, the Virgin Mary and St. Joseph. January 1 marks the joy of the Holy Virgin. Christmas tide continues beyond the Octave until the Baptism of Christ, which in the Roman Catholic calendar is marked on the first Sunday after Epiphany (January 6). Throughout the Christmas holidays the clergy are clad in festive white robes. Traditions The Christmas tradition of decorating Christmas trees can be traced back to Germanic peoples in whose rituals the evergreen fir tree was the symbol of life and fertility. As Christianity spread among the peoples of Central and Northern Europe, the Christmas tree decorated with colored balls acquired a new symbolic meaning: it was put up in homes on December 24, which in Western tradition is Adam and Eve day, to symbolize the tree in the Garden of Eden. The Gospel narrative of the three Wise Men who came to prostrate themselves before the Christ child and offered him gifts of gold, frankincense and myrrh gave rise to the tradition of exchanging gifts at Christmas. Traditionally the family sits down to a Christmas dinner, with the festive food differing from country to country. in the celebration of the Mass.The structure of the Mass remains the same. However, the translation of the prayer texts changedto more closely reflect the original Latin texts. Please make a conscious effort to participate in the Mass. It was wonderful to hear and see our teens and children lead the Holy Rosary. We're sure our Blessed Mother Mary is delighted with such an offering. We hope that doing such a role impacts our youth - that, praying the Rosary will be a part of their life. We thank our youth and their parents who helped in the preparation. Let us do everything we can as Catholics, adults, parents to promote a love and devotion for the Rosary in our homes. Remember the 15 promises of our Blessed Mother to St. Dominic. May our devotion for Lady of the Holy Rosary and Fatima bring us closer to God, bring peace to our personal lives and peace to the entire world. "Roslindale Day Parade". Please plan accordingly. Bring your family & friends to attend our Eucharistic celebration. Please come, join us for a fun-filled day. All are welcome! Bring your whole family. Event Activities: Marian Procession & Mass with Cardinal Sean O'Malley. Spiritual and fun activities for the whole family. Cultural Gala honoring Blessed John Paul II. Come pray with us this coming Tuesday, June 7th as we continue our series BLESSED JOHN PAUL with guest speaker Bob Lesnefsky! Please join us from 7:00 - 9:00pm for a great night of worship at Fontbonne Academy, 930 Brook Road in Milton, MA. Come join in worship and experience the glory of God with hundreds of Catholics from around the Boston area. We hope to see you Tuesday night at LIFT! The Filipino Apostolate is sponsoring a separate Lenten Retreat for the Adults and Youth/Young Adults. Come, spend a day of contemplation and appreciation for the season of Lent and the sacrament of Reconciliation. WHO: Open to all adults. Please invite your family and friends. DETAILS: The day will include 3 presentations.Fr. Arnel Aquino, SJ will speak about the importance of fasting and penance as part of life. Fr.Cyriac, MS will focus on the significance of unity and reconciliation as an ingredient in one's spirituality- a way of maintaining inner peace. Dorothy Levesque will stress the positive consequence of healthy daily examination of conscience - a method that leads to awe at the love and generosity of our God. We will have Exposition of the Blessed Sacrament, Confessions and Holy Mass. Lunch will be provided. The suggested donation to attend the Retreat is $10 per adult. All donations will go to the Shrine. TO REGISTER FOR ADULT RETREAT NOW: Click link below. Deadline for registration is April 3rd. TO REGISTER FOR YOUTH RETREAT NOW: Click link below. Deadline for registration: April 9th.